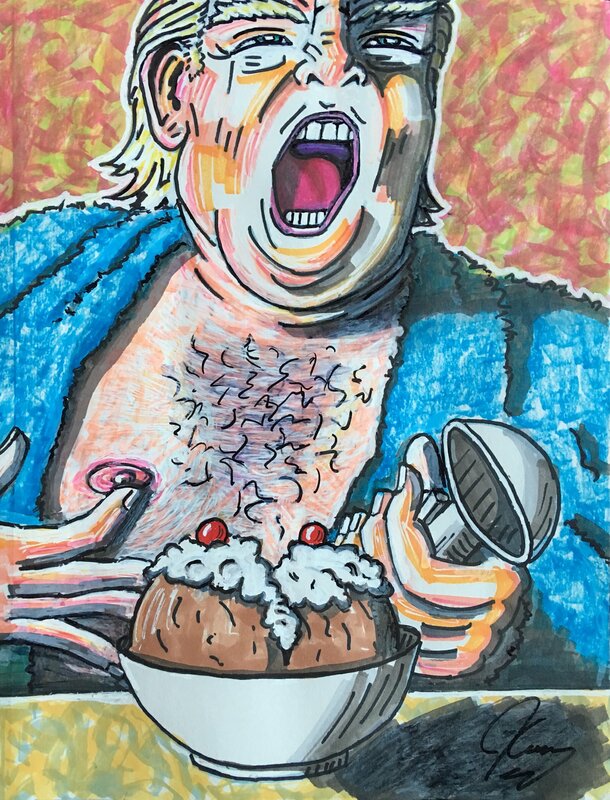 Jim Carrey's cartoons on Twitter, have become very popular and for a good reason. Not only because he's great at drawing but also because of the political satire relieve they give us. Next month they will be on display in a Los Angeles Gallery exhibition. He was interviewed about his cartoons by USA Today in a new article. Jim Carrey's inspiration is constant: "They just keep coming. They just happen. Some concern comes up and some twist comes out of the news." He even has some favorites - 'You Scream. I Scream. Will We Ever Stop Screaming?,' in which a bare-chested president appears overly excited about getting two scoops of ice cream, and another in which an authority figure holds a severed cat's tail and asks a child-size, pajama-clad presidential aide Stephen Miller: "Stephen � Where's the rest of the car?" "I love the ice cream drawing that I submitted to the Smithsonian as a presidential portrait," he says. Of the cartoon featuring Miller, drawn when the separation of children from parents at the Mexican border became a front-page story, Carrey says, "When evil is encouraged to flourish, sociopaths rise to the top and you get all kinds of crazies." But even though Jim's drawing may show his emotions he has said he has a social-media fail-safe. His assistant controls his Twitter account and she and some friends look at his art and commentary before they are posted. "They have opinions. Sometimes, they go, 'Go!' And sometimes they go, 'Don't do it! ', which I think everybody needs. You could make a job out of being a Twitter proofreader. The president needs one of those," he says. Trump never reacted to his drawings, so its hard to tell what he would think: "He's a narcissist. It could go either way. He could love it � because it's about him. When people say (Trump) is a narcissist and we should ignore him: No. Black out Donald Trump for a week and you'll see war with North Korea." Of course that his cartoons don't please everyone and when former Arkansas Governor Mike Huckabee voiced his opinion about a cartoon made of his daughter, Jim didn't agree with him: "They tried to turn it into something I should be ashamed of. But it wasn't something I could be ashamed of because liars are liars, and ugly starts on the inside," he says. "I wasn't drawing an ugly person; I was drawing a person who had become ugly." "I value criticism. But some of it's just sick. And you'll get yourself worked up over a comment and you'll realize it could just as easily be a bot." Jim also views social media as "another place to play, another canvas. Twitter is like having an open front door and a sign that says, 'If you want to kick me in the stomach, feel free. But I'm the one doing the kicking right now." 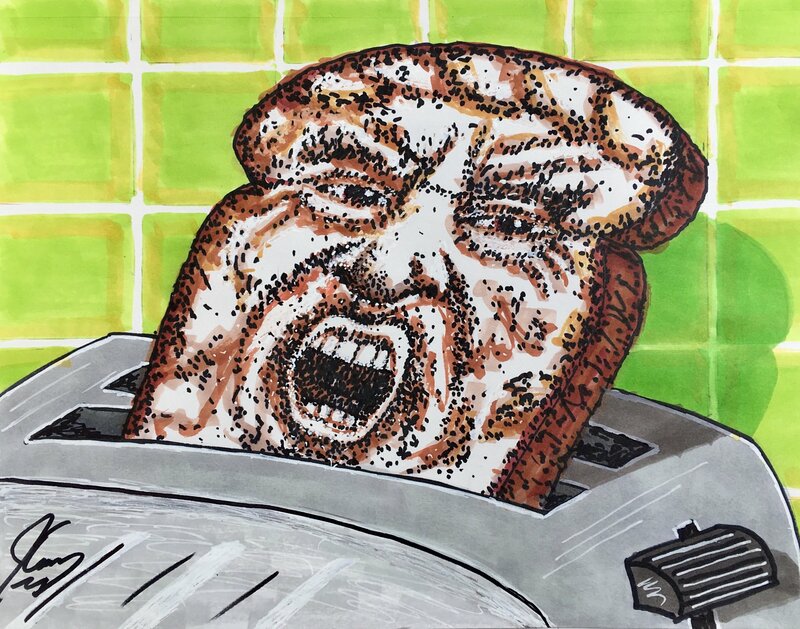 Jim Carrey has made more than 150 drawings and 80 of them will be featured in a Los Angeles Gallery exhibition titled "IndigNation," on display from October 13 - November 10. You can stop by to see them! We are very happy and proud of him. -- Source: USA Today. With thanks to Terry Lynn Marvin. Click to comment this article.